At last we are coming out of the depths of Winter and it certainly shows in this issue of the magazine as our writers seem to have a spring in their step and have put together a fantastic issue for you. Vol 14 Issue 11 sees firstly an in-depth review on Nuprol’s new AK’s. Its nice to see a review from people that know what they are talking about and you will get this in not only Nuprols new Romeo Series but also Tokyo Marui’s 416 Delta and ICS’s BLE XFG pistol too. 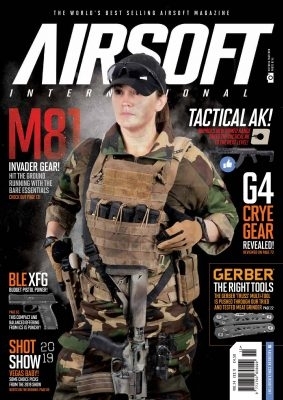 Our Gear Up this issue sees us go down under to the SASR with a great loadout to see you through the spring months. High speed, low drag sees kit from Invader Gear and their take on M81 woodland, Zshot and Warrior. Gerber have sent us their ‘Truss” range to review, we have more plate carriers than you can shake a stick at and Head to head shows you some top end hearing protection before we show you our budget versions next month. Victoria has been busy, not only has she been gracing us with her presents at the studio doing photoshoots, yes that is the lovely lady herself on the cover but she has also been out shooting you guys at Project X Airsoft, and is also looking at Apparel Wear outlets and taking us on a journey of all her favourite looks. Crye are back with their Gen 4 looks and we take you on a short trip round Vegas’s iconic Shot Show and show you what you missed. Out on sale 14th February 2019 from all your favourite Airsoft and Newsagents, direct from our website and digital through pocketmags.com. 72-73 Crye Gen 4 – Its Here!